The editorial in Panchjanya calls Rahul “over excited” on the issue, and says his aggressiveness has created panic for other Congress leaders. The editorial in Panchjanya targets Congress president Rahul Gandhi for his continuous attack on the Narendra Modi-led NDA government over the Rafale aircraft deal. The editorial calls Rahul “over excited” on the issue, and says his aggressiveness has created panic for other Congress leaders. The editorial claims that there was no room left to play politics after Air Force Deputy Chief Air Marshal R Nambiar asserted that the recent Rafale aircraft deal was “much better” than the one negotiated earlier. The editorial adds: “First, the facts on the same issue, the Rafale deal, cannot differ across platforms. Rahul initially gave a figure of Rs 36,000 crore but,after four tweets, the figure has reached Rs 1,300,00 crore”. 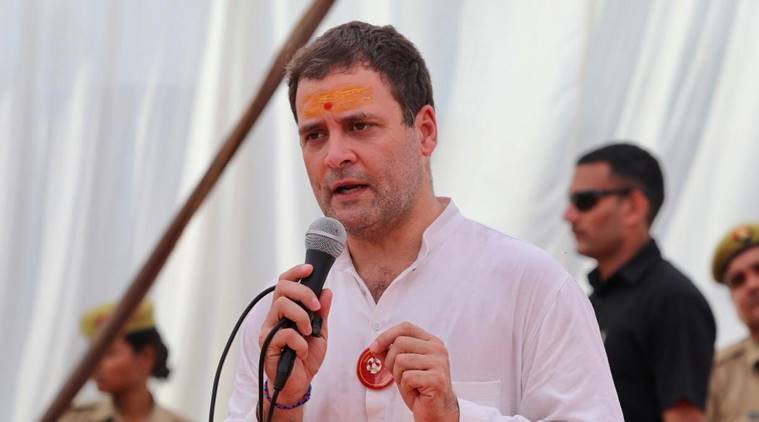 It also claims that Rahul took an alleged remark of former French President Francois Hollande on the Rafale deal as a confirmation of his allegations of a scam. But the Congress president has forgotten that people in France have stopped taking Hollande seriously. Another thing Rahul forgot, according to Panchjanya, is that the replacement of Hindustan Aeronautics Limited (HAL) with Reliance was made a part of the deal when Manmohan Singh was prime minister and Sonia Gandhi was the Congress president. “An attempt to draw parallels between the two original thinkers does not mean Gandhiji is being appropriated by someone or Deendayalji was a Gandhian. It simply means, whosoever tried to understand Bharat from Bharatiya point of view, considered decolonisation as a pre-condition of nationalisation. Having the confidence in ancestral wisdom is just a part of it, making it relevant to the changing times is the key,” the editorial says. Against the backdrop of the killing of two youths who were opposing the recruitment of Urdu teachers in a school in West Bengal, a cover story in Organiser says that Mamata Banerjee and the TMC came to power in Bengal with the “clarion call of Maa, Mati, Manush. However, the political environment under the Trinamool Congress was snatching sons from their mothers, reducing the space of Bangla and giving it to Urdu, and insensitively shooting down the people”. “Two Dalit youths who were leading the protest in a local school to replace Urdu and reinstate Bangla-medium teachers are now dead! While politicians, parties, police and intelligentsia are busy finding a ‘communal’ angle to the tragedy and blaming each other, the Bengali conscience has been attacked yet again. ‘Nandigram’ has been created yet again,” claims the article. Another article, as a part of the Organiser cover story, questions the silence of different political parties on the killing of these youths. It says that two years and eight months after the suicide of Rohith Vemula became a national rage, another incident takes place. “One wonders why political parties like the Congress, Aam Aadmi Party, and the Left have not shown any engagement, forget anger, in this case. Surprisingly, the ‘mainstream media’ that had organised hundreds of debates over the suicide of Rohith Vemula by terming it a institutional murder has kept mum over the killing,” the article points out.